In The New Prophets of Capital, Nicole Aschoff makes clear that there is something new, pervasive, and anti-democratic going on that we ignore at our peril. 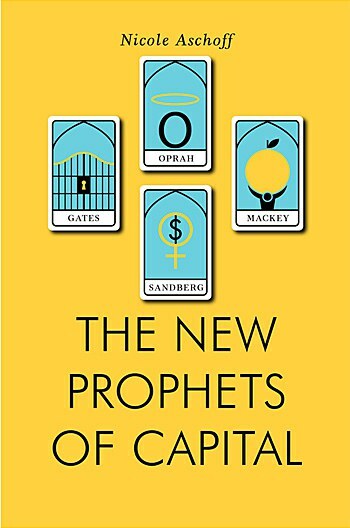 Upon first glance, it would be easy to overlook Nicole Aschoff’s new book, The New Prophets of Capital. The book's central premise—that the modern-day pillars of capitalism continue to buttress an exploitative system—is far from groundbreaking. The cover is simple and unsexy (and will appeal primarily to Wes Anderson devotees). The book is short—perhaps too short. All this is unfortunate, because for all the legions of academics who continue to offer (often tired) critiques of capitalism, in her new book Aschoff makes clear that there is something new, pervasive, and anti-democratic going on that we ignore at our peril. In an age when names like Steve Jobs and Bill Gates are spoken with near-religious reverence, and figures like Sheryl Sandberg and Oprah Winfrey stand as the beacons for women’s empowerment, it’s a good time to be an entrepreneur. In many ways, modern entrepreneurs and CEOs are akin to the political heroes of decades prior, with society’s hope in the emancipatory potential of revolutionary politics now placed in our most successful free marketeers. But is this deification of the most innovative and wealthiest among us contributing to the decline of progressive communal politics? Is the free market—and our CEO-saints—the solution to all of our political, environmental, and social ills? Income inequality continues to spiral out of control, particularly in the United States, and the richest members of society continue to amass absurd wealth. At the same time, millennials face an abysmal job market, and those of us who are lucky enough to have jobs are often forced to take on an astonishing level of debt. What fills our days? As we watch our debt rise at the same rate as Apple stocks, it makes us feel good, for a moment, to buy a latte where ten percent of the proceeds go to starving Guatamalan children. It makes us feel good to browse headlines about the richest philanthropists pledging to give away half of their fantastic wealth before they die. In podcasts and bookstores, Sheryl Sandberg empowers us, and tells us that what women really need to do is “lean in”, and we listen. At the same time, from our TV screens to the magazine rack (or app, as it were), Oprah tells us that the secret to happiness, peace of mind, and liberation from the forces that oppress us is all in our minds. After work, we buy “organic” at Whole Foods (when we can afford to shop there) and feel good that everyone involved in the production and distribution of our groceries—from the farm to the checkout counter—is treated well; or, at least better than in other, less-hip supermarkets. But how often do we challenge our assumptions about this type of feel-good capitalism? How often do we question the reverence with which we treat the most prominent philanthro-capitalists of our time? Rarely, because we know, deep down, that the psychic weight of our discoveries might be enough to drown us, as Aschoff demonstrates here. In The New Prophets Of Capital, Aschoff pulls back the curtain on the Oz that is modern-day philanthro-capitalism and exposes the negative consequences of Western society’s never-ending celebration of the free market, and those who promote capitalism as the salve to all of our planetary wounds. The Cold War has been over for nearly 25 years—capitalism "won". As Achoff demonstrates, it’s never been easier for the most prominent philanthro-capitalists to persuade the general public that the solutions to all of society’s ills—from healthcare to education to the environment and beyond—lie in the free market. The author argues convincingly that this is patently untrue, that the internal contradictions of capitalism continue to promote inequality and injustice, and that organizations such as the Gates Foundation and Whole Foods often gloss over or fail to acknowledge the inherent shortcomings of the free market in facilitating social and environmental justice. In her most moving passages, the author describes how the omnipresent, spectacular success of women like Sheryl Sandberg and Oprah Winfrey blind us to the very real and persistent challenges women face in the workplace and in society, and cause us to overlook the structural processes and practices that continue to enforce gender inequality. Not everyone can be Oprah, we all realize, but at the same time we often overlook the fact that not all women have the necessary agency and resources to “lean in;” and, for some women (particularly women of colour, and women in poverty), no amount of positive thinking or “taking individual responsibility” will be enough to change that. The New Prophets of Capital shows us how dangerous our belief in the high ethics and meritocratic spirit of modern-day capitalism can be to collective action, social justice, and progressive change. But moving forward, it will be important to examine in greater depth exactly how this “free-market-as-salve” ethos permeates, and flourishes in our media. In the wake of Occupy Wall Street, and increasing public discussion of income inequality, how might this new “ethical capitalism” mutate in the years to come? As environmental catastrophe looms, and gross inequality continues to proliferate, how might the central narrative of "ethical capitalism" adapt in the years ahead so that it continues to remain palatable to, for example, your typical Whole Foods customer? More importantly, what are some strategies we can employ to challenge this narrative among a wider audience? The problem isn’t that we don’t realize the inherent contradictions, injustice, and inequality of the free market, but that we sate our appetite for change with minor gestures that uphold and promote the false narrative of feel-good capitalism. We watch TED talks and donate what little we have to spare to the Gates Foundation, without following up to discover the real-world consequences of our contribution. We read books like The New Prophets of Capital and buy "fair-trade" products, and think we are somehow above the masses of “uninformed” consumers. We make the attempt to “lean in” as individuals, and then blame ourselves when we face structural roadblocks to success. I’m a capitalist. If you’re reading this, you probably are, too. As Slovenian philosopher Slavoj Zizek reminds us, it’s easier for most of us to imagine the end of humanity on Earth than it is to imagine minor changes in the way capitalism functions so that it might promote greater social justice and equality. The New Prophets of Capital, while short on practical recipes for progress, shows us how the narrative of “feel-good capitalism” helps to eradicate public interest in alternatives or even minor adjustments to modern capitalism. Moving forward, the principle benefactors of the free market will continue to be its most vocal proponents. Despite their good intentions, we owe it to ourselves to be skeptical of people such as Sheryl Sandberg and Bill Gates, who tout the emancipatory potential of the free market without acknowledging its inherent limitations.